Griffith Lake is located in the Grand Mesa National Forest near Grand Junction, Colorado. The close proximity to Highway 65, which is maintained through the winter months, makes the area convenient for Nordic activities such as snowshoeing and cross country skiing. One other advantage is that the point of departure for this outing is the pullout along Highway 65 that is just prior to the road closure gate. So even when access to the rest of the Grand Mesa is cutoff you can at least make it this far. The pullout where this post begins is on the north side of the road at the road closure gates. The actual Griffith Lake trailhead is a little further up the road but for actually snowshoeing around Griffith Lake this is the best place to begin. The tricky part is getting over the big snow berm that the plows have made. 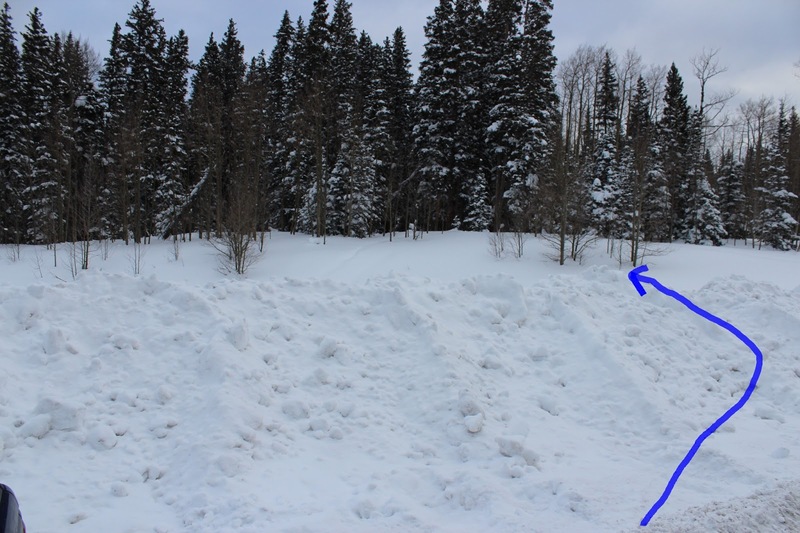 There aren't any trail markers to indicate the best spot to enter the trees but if you look for a gap due north of the middle of the parking area you will be pretty close. 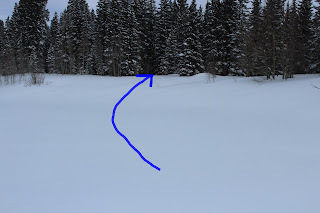 A storm had just dumped another foot of snow that covered up all previous tracks. After a short distance this route comes to the officially marked Nordic trail that passes between Waterdog Reservoir and the Griffith Lake trailhead. Following the blue diamonds to the left leads down to the Griffith Lake area. The trail descends through the trees losing about 100 feet of elevation before leveling out around the tail end of Griffith Lake. 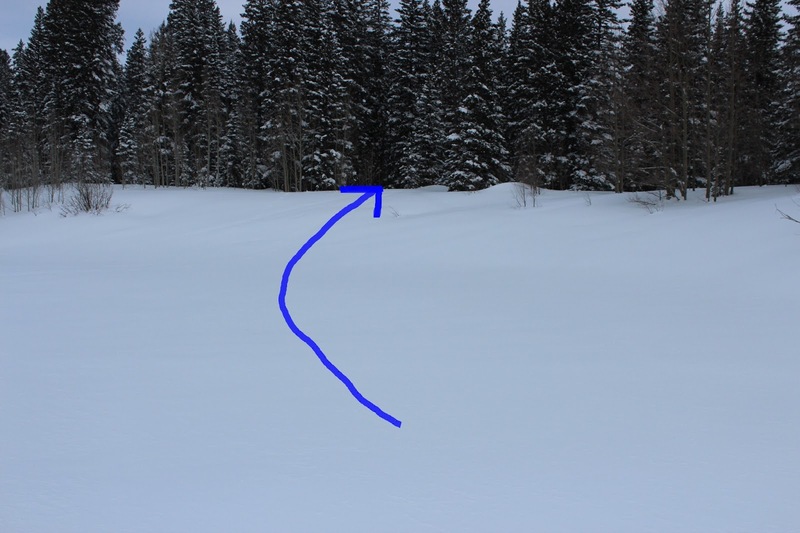 The lake is to the right so from this point a person could head off in either direction and snowshoe or ski around the area until they are ready to return back up the hill. This post continues following the official trail to the left towards Waterdog Reservoir. 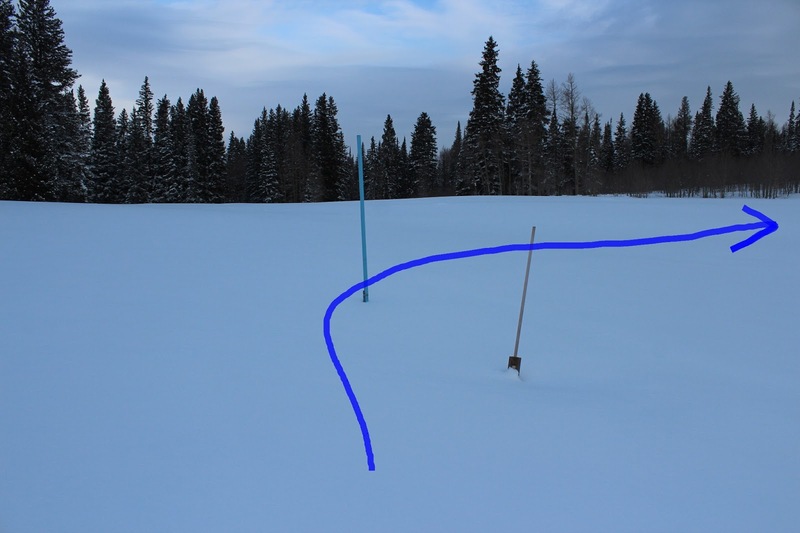 A blue marker out in the flat is a good spot to turn to the right and begin following the northern shoreline of the lake. The fresh snow is a little tougher to snowshoe through and requires lots of extra energy. 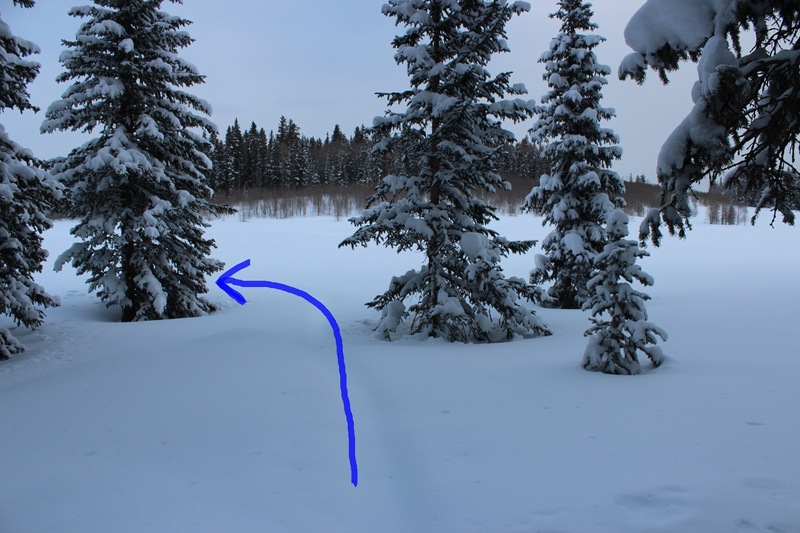 Rather than attempt to go completely around the lake I am aiming for the stand of spruce trees up ahead near the narrowest part of the lake where it should be okay to cross. This part of the lake is usually dry when the snow begins flying. Like many of the lakes and reservoirs Griffith Lake gets drained down quite a bit for irrigation. That is after all why it was built. There are a couple of springs along the opposite bank that may flow a little all winter long. Whether it was water from springs running in on top of the ice or water that was being compressed from the snow by its own weight there was a thick layer of slush about midway across the lake. 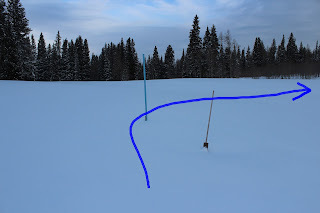 The snow was deep enough that ski poles weren't long enough to find bottom so they weren't of any use either for testing the ice. The snow had a slight shadow to it at this spot that indicated something was different about it. It only took a few steps to get through the slushy section. If you have ever done much ice fishing then you have probably encountered slush on lakes in the past. It sure doesn't give a person much faith in the ice knowing that the water below the ice is 32 F and the slush on top of it is just about the same..
Rather than follow the south shoreline back to the beginning of the loop (the easy way) it seemed like a good time to take advantage of carrying a GPS and cut through the trees (the hard way) and see some places that only the animals see. The trek through the woods was all uphill and slow going but it was very pretty. With the GPS it was easy to see right where the trail coming down the hillside was. If you are going to rely on your GPS to keep you out of trouble then consider taking lots of extra batteries. Unfortunately there have been people that became lost and perished in this area. This city boy carries a fire starter and SPOT satellite tracker along with a few other items even on a short excursion like this one. Even though nothing bad will ever happen to ones self you never know when you might come across someone else that needs some help. When the trees are covered with this much snow all it takes for white out conditions is a little bit of wind. The tracks near the road that were laid down only an hour or so earlier were already getting blown in and disappearing. There are usually one or two vehicles parked at this turnout but on this day it was complete solitude. This area is a little tougher than the groomed trails around Skyway and County Line but you can't beat the complete serenity. If you would like to see it for yourself then all you have to do is 'Take a hike'.